Seumas MacInnes, one of Scotlands premier restaurateurs and owner of the iconic Caf?Gandolfi in Glasgow, is not afraid to take issue with the national bard over the sobriquet Great chieftain o the puddin race. 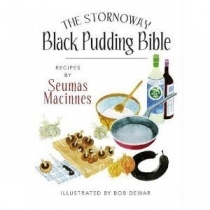 Without slighting the qualities of haggis, or indeed white pudding, he wholeheartedly maintains that the title rightfully belongs to black pudding - and, very specifically, Stornoway black pudding. The Stornoway Black Pudding Bible is a celebration of the quality and versatility of black pudding, and above all is an encouragement to strike out in novel and fresh ways of cooking and enjoying this remarkable and underrated ingredient.